Stout made, easy doing bulls were in great demand at the Cross Diamond Cattle Co. sale. 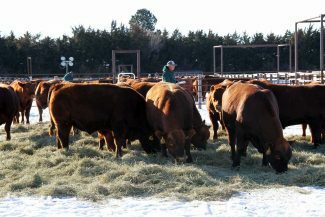 A snowy landscape and sunny skies set the backdrop for the 13th Annual Cross Diamond Cattle Company Production Sale near Bertrand, Neb. Good food and fellowship complimented the stout, sound, highly maternal sale offering of Red Angus cattle from Scott and Kim Ford, along with their cooperators, Triangle Y Cattle, Right On Cattle Company, Solid Rock Red Angus, C Lazy B Red Angus, Paxton Ranch, Horsley Red Angus, Platte River Ranch and Adolph Red Angus. Lot 1 sold for $30,000 to Right On Cattle Company, Bertrand, Neb. Crs Diamnd Rebourne 7076 is a 5L Bourne 117-48A son from a Steadfast 9001 daughter. Lot 32 sold for $30,000 to Randall and Jane Adolph, Mt. Carroll, Ill. Crs Diamnd Rebourne 7012 is a son of 5L Bourne 117-48A from a BHR Copper D 773 daughter. Lot 2 sold for $25,000 to Gilroy Land & Cattle, Dalton, Neb. Crs Diamnd Cliffhanger 746 is a Poke Clifftop 5378 son from a Foundation daughter. Lot 35 sold for $20,000 to Gilroy Land & Cattle, Dalton, Neb. Crs Diamnd Concurrence 7291 is a Crs Diamnd Synergy 394 son from a Crs Diamnd EXT 0435 daughter. Lot 105 also sold to Gilroy Land & Cattle for $20,000. Crs Diamnd Landslide 7065 is a Poke NebP707 1064 son from a Crs Diamnd Allegiance 0235 daughter. Lot 37 sold to M3 Cattle Company, Henryetta, Okla. for $20,000. 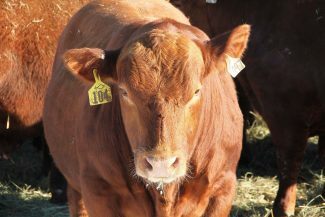 Crs Diamnd Rebourne 769 is a 5L Bourne 117-48A son from a Dunlouise Red Native F207 daughter. Lot 39 sold to Swanson Ranch, Elwood, Neb. for $17,000. Crs Diamnd Tidal Wave 7294 is a son of Crs Diamnd Tidal Wave 374 from a 7U Julian Twice 6621 daughter. Lot 10 sold for $15,000 to Jerry Johnson, Fairfield, Tex. Crs Diamnd Boundary 794 is a son of Crs Diamnd Landslide 307 from Trotters Stronghold 156 daughter. Lot 40 sold for $15,000 to Gilroy Land and Cattle, Dalton, Neb. Crs Diamnd Sovereign 719 is a son of Crump Sovereign 3190 from a HLH C168 7076 1228 daughter. Lot 7 sold for $13,000 to Walking C Cattle, Lexington, Neb. Crs Diamnd Rebourne 7008 is a son of 5L Bourne 117-48A from a 5L Hard Rock 2188-09X daughter. The top selling heifer, Lot 251, sold $3,400 to Marie Ford, Bertrand, Neb. Adph Rita Z206 F841 is sired by HLH Right Kind 4135 from a Crs Diamnd Hustler 833 daughter. Also selling for $3,400, consigned by Triangle Y Cattle, was Lot 255, to Nicki Adolph, Mt. Carroll, Ill. CAB Julianne 8016 is a 7U Julian Twice 6621 daughter from a Beckton Herald P375 daughter. Volume buyers were LeBlanc Cattle Company, East Bernard, Tex. with 15 bulls; Ken Wilson, Rapid Creek Ranch, Belvidere, So. Dak. with 10 bulls and Glenn Cattle Company, Fort Morgan, Colo. with 9 bulls. Nathan Buntin, of Ashby, Neb. won the Ag Youth Initiative heifer drawing.